Meghna Bank Limited Job Circular 2018 has been published. Meghna Bank is the newly best commercial bank in Bangladesh. Meghna Bank Limited is a Bank with the vision to become the leader in financial services in the country by fostering a culture that stresses the highest ethical standards. Meghan Bank Limited is a sustainable financial institution through financial inclusion as the dynamic commercial bank. Meghna Bank is a Bank with the vision to become the leader in financial services in the country by fostering a culture that stresses the highest ethical standard. Meghna Bank Limited, A Company of Mobility I Tap Pay (Bangladesh) Ltd will recruit for various posts. 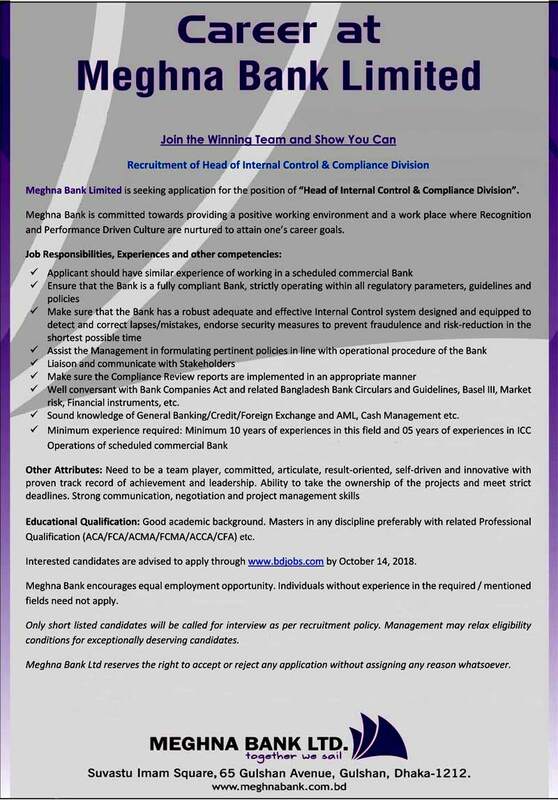 In order to meet the requirements the company invites applications from the suitable candidates for the following posts: So if you are ready to take a voyage in a vibrant and challenging corporate environment and eager to fast track your career in a professional and institutionally managed environment please to apply to Meghna Bank Job Circular 2018. Job Description: Meghna Bank to strengthen and enrich our workforce and to create future leaders we are going to hire Management Trainee Officers who will share our vision and will execute our mission for sustainable growth and excellence. Meghna Bank Limited is a new third generation bank in Bangladesh. Meghna Bank Limited is recruiting employees so you can apply these job vacancies. The position offers monthly consolidated remuneration of Tk. 35,000/- for the probation period. On successful completion of probation period of 1 (one) year and subject to qualifying the prescribed tests, the candidates will be absorbed as Senior Officer in the Meghna Bank. Meghna Bank Job Circular 2018. Meghna Bank Limited candidates selected for appointment as Office (Cash), Officer (Credit/ Foreign Trade), Branch Manager/ Deputy Manager has been recruitment for this position. Only shortlisted candidates will be called for written test and interview as per recruitment policy.